Wires on a stator have a tendency to go very brittle over time and the outside insulation can crack off and create a short. 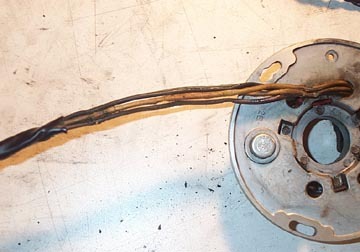 Replacing the wires is cheap, pretty easy to do, and will resurrect a stator in no time. ..further inspection showed the wires were also cracked at the stator plate.Tis means they should be replaced completely. The first step is to clip the ends off the old wires. This will allow you to slide the remaining wire back out through the black wire casing. On some stators the black casing is held in place with a small zip tie which should be cut off. Slide the black wire casing to expose the wires. This is can also be handy because sometimes the wires at the connection end have really lost their color. 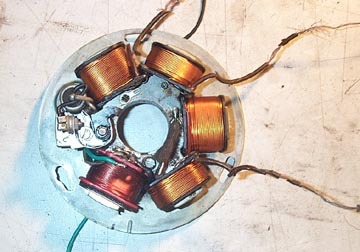 On this Vespa P125X stator, the two yellow wires had turned to brown at the junction box, but were still yellow under the wire casing. Trace the wires back to where they are soldered to the coils. Sometimes wires pass under another coil before they exit from the back of the stator. If you have any doubts about how it all goes back together, make a little diagram showing what connects to where as you take it apart. 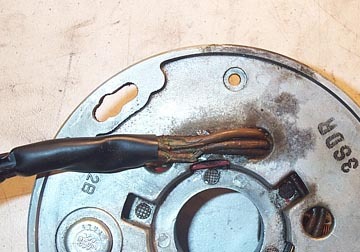 It wasn't necessary to rewire the condensor or points on this stator but the same idea as the following wire replacements apply. Cut some 18" lengths of wire in the correct colors, strip one end, twirl the end together, and use some solder to get a thin coating of it over the end. This will make it easier to connect it to the coil. 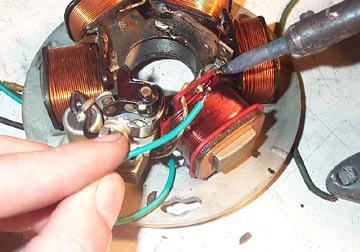 Use the soldering iron to melt the blob of solder where the old wire connects to the coil. 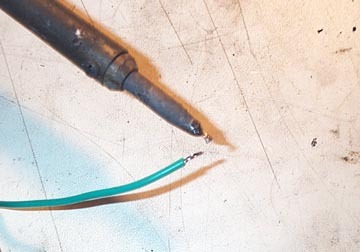 Gently tug on the old wire as you melt the solder and it should pull away. When it is free use the new wire and attach it in the same location. For now leave all the wires free rather than routing them through the stator hole. 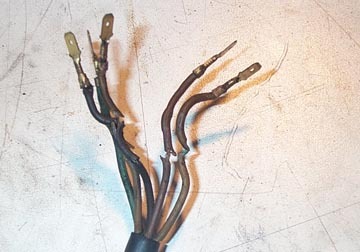 Once all the wires are connected, run them in the same manner as the ones you removed. Once they are passed through the stator holes, thread them in to the old black wire casing. If you want to you can use a new small zip tie to cinch it up once all the wires are through. Refit the stator with the long wires coming out through the casing hole. Since I used 18" lengths there was more than enough sticking out at the junction box. 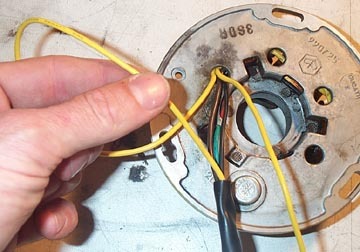 Using a crimp tool and the new spade connectors, carefully determine how much you can cut off each wire so that the connector will reach the existing female connectors in the junction box. Strip off about 3/16" of the insulation and crimp the spade connector on. 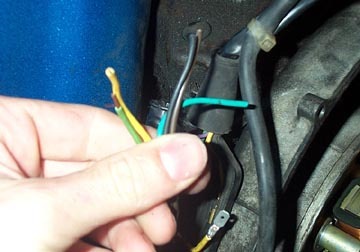 Please note that since the stator was installed before the wires were crimped you can run in to some problems. 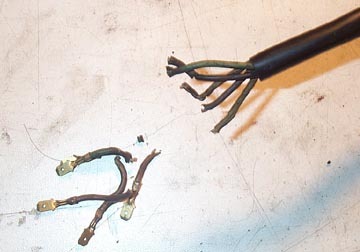 If you use bigger than normal connectors you may be unable to remove the stator in the future. I found that Radio Shack connectors (part# 64-3132) with the plastic casing removed were a perfect match to the originals.